After losing most of their equipment during a wicked storm in Chicago last week, Passion Pit returned last night to the legendary Ed Sullivan Theatre with vengeance. The live performance was about an hour long and featured tracks from their newest album Gossamer, along with some Passion Pit classics including "Sleepyhead" and of course "Little Secrets." Passion Pit will continue their North American Tour in NYC on Friday (9/5) and Saturday (9/6) with special guest Best Coast at the infamous Pier 26. Tickets are still on sale for both performances and currently available on their official tour website. 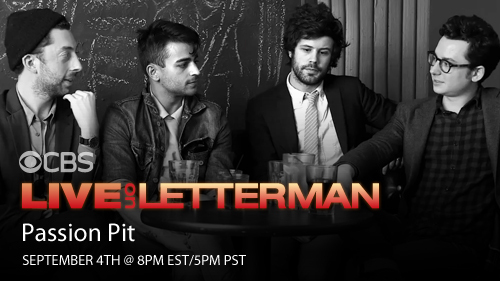 Check out the full setlist below and stream Passion Pit's "Live on Letterman" performance here. This was the best passion pit performance yet!! !